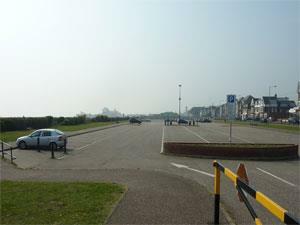 North Drive Car Park, Great Yarmouth, is a long stay car park with 232 spaces and 16 spaces for the disabled opposite the Imperial Hotel on North Drive, 5 minutes walk from Marine Parade. Open April - October, closed over winter. 2 metre height limit. Open April - October from 7am until 9pm (open until 11pm on firework nights in summer). Closed over winter. On arrival in Great Yarmouth, follow signs for the seafront. At the mini roundabout, turn left. Drive along North Drive for a short way past the bowling greens and tennis courts on your left. The entrance to North Drive Car Park is on the left, just before the Venetian Waterways. Turn left and immediatelty left again into the car park just past the Imperial Hotel, opposite Sandown Road.